The Clippers spent a good part of Tuesday’s practice working on defensive rotations. During the team’s 5-on-5 scrimmage, the coaching staff would have one practice squad run a high pick-and-roll, with a direction by Mike Dunleavy to go left or right off the action. The defensive unit was then ordered to trap or “red” the point guard, which means the PG’s primary defender would crowd him directly on his shoulder, with the screener’s defender joining his teammate out on the perimeter. Basic perimeter trap, but effective only if the back line defenders rotate with quickness and precision. This coverage scheme is the backbone of most NBA defenses on half-court S/R possessions. The teams that perform this task well (Cleveland, San Antonio, Houston, New Orleans) tend to prosper. Teams that struggle on defensive rotations get shredded, particularly by offenses who can spread the floor with shooters. Remember these guys? Defense was their middle name. Will the Clippers be a solid halfcourt defensive team this season? In some sense, defensive rotations are a lot like officiating in basketball. When your team’s defense is rotating effectively, you hardly notice it. When they blow it, it’s painfully obvious and aggravating. Let’s rewind to 2005-06, when the Clippers were the 7th most efficient defense in the league. One of the bedrock strengths of that team was the alacrity of their half-court defense. On a 1-5 pick-and-roll, Cassell and Kaman would blitz the ballhandler, and the backline trio of Elton Brand, Cuttino Mobley and Quinton Ross would pick up the screener and still get to their respective spots along the perimeter. 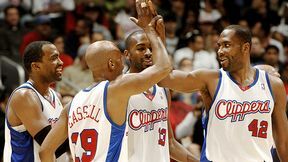 That season, the Clips played 3-on-4 defense in those situations as well as any team in the league, which is why, despite being a below-average offensive squad, they were a Raja Bell hail mary away from a conference final berth. That 2005-06 team knew how to read half-court defenses even though, with the possible exception of Ross, none of the other four players in that lineup were All-NBA defenders. But Brand and Mobley had acute court awareness and were tough as nails. That season, you could watch 40 defensive possessions before seeing a blown rotation. Though many Clippers fans might be loath to admit it, Mike Dunleavy had a lot to do with that. For this year’s Clippers, getting from chaos to fluency is going to take a little time. Will this team have the personnel and collective smarts to replicate that 2005-06 defense? It’s certainly possible. If you swap out Al Thornton for Rasual Butler, the Clippers’ “three man rotation” defending a 1-5 pick-and-roll would be composed of Eric Gordon, Rasual Butler, and Blake Griffin/Marcus Camby/Chris Kaman. Aside from the beastliness, explosiveness, athleticism, balance, and general immortality Griffin displayed at Summer League, Dunleavy was most impressed with the rookie’s reads on defense. “He really got the rotations,” Dunleavy has said … three times in interviews over the past eight weeks. He’s telling the truth. Not only was Griffin routinely at the right spot, he reacted with ease to nearly every offensive counter. On top of that, he was a vocal traffic cop on D. In short, he got it. Rasual Butler has the length and wherewithal to bounce from a cutter back to the perimeter effectively. The upgrade over Thornton in this department is almost inestimable. The wild card here is Eric Gordon. Though EJ has the strength to body up as a man defender against many opposing shooting guards, he has yet to master team defense and has a long way to go before he’s Cat Mobley. But there’s tremendous upside here. Gordon played with dozens of lineups last season and it’s unreasonable to expect a young rookie to grasp the nuances of NBA rotations — particularly when there was a different defensive unit out there each time he took the floor … and that unit often included the likes of Thornton and Zach Randolph. When you consider that collection of players last season, it’s no wonder the Clips finished 27th in defensive efficiency. This season, Butler will take tremendous pressure off Gordon on the wing. If Griffin is as quick a study defensively as he’s demonstrated early, the Clippers could be a dramatically different, and vastly improved, defensive unit. Compliment Griffin and Gordon all you want, but can you find any precedent for an elite defensive unit that depends on the instincts of a couple of 20 year olds? I’ve been asked/forced to go on record with a prediction of the Clippers’ win total this season, and the optimistic number I’ve come up with is 36-38. And it’s this dynamic — along with the rebounding on the wings — that’s kept that number in check. This fear isn’t without a disclaimer — it’s early. Although some believe that the ability of a player to understand half-court defense is a hard-wired intuition, there’s plenty of evidence that a player can cultivate that defensive readiness. Note the future progressive tense here. It will be really good. But that could take some time and there are several rotation players on the squad for whom that time could be an eternity: Thornton, Steve Novak, DeAndre Jordan, Ricky Davis (at times). Gordon still has a ways to go. Chris Kaman is a sold interior defender, but becomes less capable the farther away from the basket. At this juncture, only Marcus Camby and Butler can be depended on for crisp possession in-possession out rotations. Another uncertain piece here: Baron Davis’ ability to contain the ballhandler. For all his defensive failings — and they were many — Cassell knew he’d be beaten off most S/Rs, but he was very good about funneling the opposing PG to the right spot. Baron has been a very, very good defender in the past. Last year? Well, you watched the games. You tell me. Will Baron recommit himself this season? There are a lot of uncertainties and the prospect of this collection of players replicating the air-tight 2005-06 squad defensively are very, very remote. If this season’s Clippers can finish in the high-teens in defensive efficiency, that would be a vast improvement — but still leave them as a 30-ish win team. The Hope: Gordon and Griffin become quick studies under the tutelage of a coach whose specialty is this kind of instruction. The Fear: That learning process takes far longer than anticipated. Thornton continues to get the bulk of the minutes at the 3, and the base pick-and-roll defense up top will leak like a sieve.